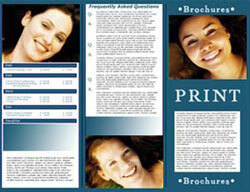 Newsletters and pamphlets are wonderful branding tools that make a statement about your business. Newsletters can be printed on a variety of different papers and use a anything from single color simplicity to 4 color glossy splendor. A variety of size options are available. 8-1/2 x 11 is the standard newsletter size. Generally from 2 to 8 pages or more with custom ordering options. Simple single color or full color photos and graphics bring your Newsletter to life. 11 x 17 large newsletter size. Generally from 2 to 8 pages or more with custom ordering options. Simple single color or full color photos and graphics bring your Newsletter to life. Available in a variety of paper weights and with different folding options. 11 x 25-1/2 – is the largest newsletter size. Generally from 2 to 8 pages or more with custom ordering options. Simple single color or full color photos and graphics bring your Newsletter to life. Available in a variety of paper weights and with different folding options.